Valery Gergiev Interview with Bruce Duffie . . . . . . The Russian conductor Valery Gergiev is an international sensation. His appearances in both concert and opera in Russia, Europe and America are always sold-out, and the numerous recordings and videos he has made bring an ever growing repertoire to an expanding public. From an unofficial website, here are a few details of his life and career . . . . . Since he burst onto the international scene just a few years ago, Valery Gergiev has become one of the most sought after conductors in the world. He is currently the Director of the Maryinsky Theater in St. Petersburg, home to the Kirov Opera and Ballet. Under his leadership, the Kirov Opera has become recognized as one of the great opera companies of the present day. He is also Principal Conductor of the Rotterdam Philharmonic and Principal Guest Conductor of the Metropolitan Opera. Born in Moscow in 1953, Valery Gergiev grew up in the Caucasus, the mountainous area at the Southern end of Russia, stretching from the Black Sea to the Caspian Sea. He began his musical studies in Ordzhonikidze, the Caucasian capital of Ossetia , and showed early prodigious talent as a pianist before taking up conducting in his teens. He was accepted into the conducting class of Ilya Musin at the Leningrad (now St Petersburg) Conservatory, and whilst still a student won the All Union Conductors Competition in Moscow and the Herbert von Karajan Conductors Competition in Berlin at the age of 23. He made his Kirov Opera debut in 1978 with War and Peace and later became assistant conductor to Yuri Temirkanov. 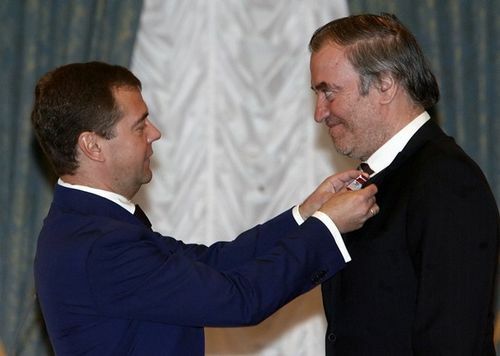 In 1988 Gergiev was designated artistic director and principal conductor. In 1996, the Russian government appointed him director of the Mariinsky Theatre. He has appeared with all the leading orchestras of the former Soviet Union and for four years was chief conductor of the Armenian State Orchestra. Gergiev has guest conducted most of the world's major orchestras, including the Los Angeles Philharmonic, San Francisco Symphony, Amsterdam's Royal Concertgebouw, London's Royal Philharmonic, Rome's Santa Cecilia, Boston Symphony Orchestra, Chicago Symphony Orchestra, Cleveland Orchestra, London Philharmonic, London Symphony, Tokyo's NHK Symphony, and the Berlin Philharmonic. Now, as one of music’s busiest and most sought-after conductors, he is regularly applauded at the podiums of the major opera houses and orchestras of the world. Maestro Gergiev is the organizer of St. Petersburg ’s annual "White Nights Festival," the "Rotterdam Philharmonic/Gergiev Festival," and is director and founder of the Mikkeli International Festival in Finland , the Peace to the Caucasus Festival, and the Red Sea International Music Festival in Eilat , Israel . In October of 1992, Gergiev came to Chicago to lead the Chicago Symphony in a program of Beethoven and Scriabin. He graciously permitted me to do the interview backstage immediately after the second concert of the series. Here is what was said during that half-hour . . . . .
Bruce Duffie: You conduct a lot in Russia and you also conduct a lot in the West. What is the biggest thing that you need to teach Western orchestras about Russian music? Valery Gergiev: Western orchestras, I think, are very, very fine ensembles. Most of orchestras I conducted the last three or four years are quite good, both in America and Europe. The thing about Russian music is maybe to find the soul. We often use this word "soul," the soul of the music, and perform so that it will speak. That instrumental quality and brilliance in the soul is something that is sort of a weapon for expressing the soul of the piece. This is how I put it. Maybe it's a good thing that not every time - not every conductor, not every orchestra - is playing Russian music the same way. I think it's very good, because in America you have not just one way to perform Tchaikovsky. Even between different American orchestras there are some different traditions. For example, we know that Koussevitzky was long time with Boston, or Stokowski who was long time with Philadelphia, there are some very different traditions. The same is in Russia. There are many interpretations which are typically Russian, interpretations from the Leningrad School, like Mravinsky, or from Moscow. There are very, very fine interpreters and they're quite different. Sometimes I find the difference very narrow between the Leningrad School and the British or Austrian, which are very aristocratic. They are closer to each other than Moscow and Leningrad. VG: Yeah! This is what I find. If we look at historical interpretations, for example, again I mention Mravinsky against earlier conductors from Moscow like Kondrashin or Svetlanov, they're quite different. BD: Is Rozhdestvensky also in this? VG: Rozhdestvensky's in Moscow, and I would say yes, he's typically a Moscow artist, but he was also very famous to discover new things. So it is difficult to compare him with Mravinsky because when Mravinsky was doing more Classical repertoire - including German or Austrian School - at the same time, Rozhdestvensky did a lot of world premieres, or at least discovered unknown pieces of Prokofiev or Shostakovich. So it's quite different to compare. BD: Are all of these interpretations of Russian music "right" interpretations? VG: I don't have enough authority to insist that I know what is the right interpretation. BD: Are there many right interpretations? VG: Mmmm, yes, maybe they are...several...good, solid...solid interpretations--famous. Again, Mravinsky is quite famous thanks to his recordings. I think every serious music lover knows his Tchaikovsky, but I would rather pay attention for what Mravinsky was doing with other repertoire, say Wagner, Bruckner, Beethoven, Brahms. This is something interesting. BD: He makes the bridge for the West to the East then? VG: Yes. He was very much a product of Russian and German culture. Both cultures influenced strongly Mravinsky. He never conducted Verdi operas or Donizetti or Rossini, but he was a very, very special interpreter of Bruckner and Wagner. That's what I remember myself. BD: I want to concentrate on you and your conducting. When you're preparing an orchestra, is all the work done at rehearsal, or do you leave something for the night of performance? VG: In the West, the time is limited. For example, tonight's program requires a lot of serious work, especially if you take into consideration that Scriabin is not performed every day here, and it's quite long. Also, musical materials sometimes need some special attention because there are some differences - and even mistakes in the parts - so one spends a lot of time during rehearsal just correcting them. In this case, most of what you try to emotionally put into the performance comes during the concert. What can help you with the live contact is maybe just your hands or your eyes. Those provide immediate and spontaneous contact with the musicians. What makes performances of this late Romantic repertoire quite intriguing is when many things are left for the concert. But at the same time it needs to be well prepared, of course, and the more the orchestra plays this repertoire, the better result you can expect. For example, I hope that tomorrow will be something new because there has been another repeat. I am already thinking of something I will achieve tomorrow. BD: So you're always looking to improve the performance. VG: I wouldn't say about togetherness. I would say about the notes are played, if you compare them to the broad river, for example, which is very wide and very calm; but if you go higher in the mountains, you see it as very fast and noisy. So maybe yesterday, the first performance contained more of this spontaneous and even speedy character, and was maybe more agitato. BD: When you tour with your own orchestra, how can you keep the tenth performance fresh, more agitato? VG: With my orchestra, most of the things which will be performed are more part of the repertoire, and more into their musical mentality. When we study, when have our educational system and we go to the conservatory, we of course have some traditions and some different interpretations that we can compare. I speak about Scriabin or Rachmaninoff or Prokofiev. My orchestra is able to play Prokofiev's The Angel of Fire, which, as you know, is a sort of a "mother score" of the symphony. I can expect something more interesting compared to just symphonic readings of this symphony, because maybe we will bring something theatrical to it. Rachmaninoff 2nd Symphony, which we performed also during our American tour, or Tchaikovsky 6th Symphony were performed for the first ever time by our orchestra, the Mariinsky Imperial Orchestra. That makes things quite interesting to play with the very same orchestra which performed for the first time these pieces. BD: Of course it's none of the same players, but it's the tradition. VG: [Chuckles] Yeah, of course. BD: Is the tradition handed down from player to player, from teacher to student? VG: Yes. You can't explain what "tradition" means, but from generation to generation it's like a wordless thing. BD: Sure, it's a feeling in your hearts. VG: Yeah. An older violinist, maybe when he was very young was sitting at the same desk with somebody who was already by that time very old and had participated maybe in the first performance, so yes, it's like we say that you take it from one and give to another, and so it goes and goes and goes. BD: Is this part of your responsibility, as a conductor, to hand down these traditions not only the players, but also to the audience behind you? VG: I don't think of myself as being that important. I don't think of tradition from Tchaikovsky or from Rachmaninoff. I feel myself more involved in simply a professional situation where I have to provide a certain level and a certain policy and a certain artistic character of the work. This is what I do with the Kirov Company, which is historically a very important institution. A lot of opera and ballet, important things as you know, are connected with this history of this theater. But now we have younger generations of solo singers and chorus, and of course many new orchestra players, so I would say there is a lot of energy which you can use to focus on something. The energy is a good thing, but one has to know what to do with this energy. We just try to do some interesting things with productions of Mussorsgky, Tchaikovsky, Prokofiev and so on. BD: Some conductors have said that they're more important but less visible in the opera house, as opposed to the orchestral platform. Is this true? VG: When I'm doing opera, I don't think how important I will look, myself. It doesn't matter that people don't see me so well, or don't watch me. They have to see and to hear the music. The visual impression has to be very strong and important from the opera. BD: Is it more work for you to hold an opera together, rather than a symphony? VG: Oh that's true; opera is more difficult. It takes your time and your energy and your health maybe more than symphonic orchestra. When you do something big with opera, this is already something that makes the whole event very important because it's difficult to achieve a very good result. It's equally difficult to make the opera orchestra sound as good as symphonic orchestra, but it's only very small part of the problem. You have got singers, chorus, scenography and many, many, many other problems. Sometimes libretto is weak or sometimes the cast is not even. There can be two or three very good singers, but one can spoil everything. So the complexity of problems in opera is huge, and that's why maybe you are happier when you finally achieve something that you find acceptable. You feel maybe happy, and you feel that, "Aha!" when opera delivers such a feeling that finally it's good, finally it's first-class and you feel very, very happy after that. With orchestras, it is very rare that I am completely satisfied because with orchestra it has to be absolutely good, and it's very rare when I can achieve very, very, very good result. When you have classical repertoire, you have straight comparisons with the very good musicians who did the same repertoire before. The level which is recognized as a very good level is quite high, so it's difficult to compete. BD: You have to get up to that level just to start, before you can achieve something beyond that? VG: To try, at least yes. Unfortunately for our generations, the old masters are quite far ahead with deepness of interpretation. It is hard to explain. I don't want to say only bad things about younger artists or my generation. I can say something about myself to be self-critical, but to be realistic, any young conductor can just go and listen to the Furtwängler recording of some German repertoire and see immediately that it's a very, very, very fine performance. Even if you achieve a polished performance sonically or rhythmically, even if the brilliance is there, you still don't have the impressive depth altogether as the old masters. This doesn't come every day. BD: Now that you're making recordings, do you perform differently in the recording studio than you do in the concert hall or the opera house? VG: I like long takes - one movement nonstop, or at least a big, big part of the whole movement of a symphony. However, there so many things which are important for recording company - if there is even smallest noise, or if they're unhappy with the sound. Sometimes they think that there was something wrong with the technical parameters, so they can ask you to repeat again and again and again. It's quite difficult to record that way, to keep always your feeling that it's live and happens now. But at the same time, I can't say I don't like recordings. Sometimes recordings make you feel a special danger, which means you have a special wish to overcome the problem. You listen to the take, and you feel that several times you are not delivering the best musical characteristic of the episode or of the whole movement. You feel it's still not what you yourself think can be called interesting music-making. That makes analyze again and again and again, to see if there is any chance to improve, to change something, to take a risk, to improvise. I would say I try to do it during recordings. I don't think of safety during recordings. BD: You don't play it safe! VG: It's difficult to be a judge of what you are doing yourself. I would like to let others talk about that, but making recordings is important issue. To record classical music in a very interesting way is quite uneasy. It is hard to feel in the recording studio that you are still an artist. What happens is that we suffer because of this clinical character. I find it extremely important that the artists keep this feeling that the performance is fresh, happening now and not connected with the hundred attempts. BD: What's the purpose of music? VG: Hmm... [Pauses for a moment] It is difficult to say now because for different societies, for different groups of people - I don't mean politics, I am just thinking of different countries - there are certain differences in how people receive music. People try to get extra-musical impressions, and may or may not work hard for that. For them, the music is not something where you just buy a ticket and go and say, "Okay I spend two or three hours being in touch with great culture." It's not guaranteed every time that you just go. One has to be more attentive, and maybe listen to a recording before the concert. They do work and preparation. Personally I like this part of the audience anywhere in the world - people who are well prepared, who know the subject quite well, who are so serious that music is part of their life. Certainly you can say that they can't live without it. For this part of audience, for these people, I not only have big respect, but I can be witness. I saw many times in my life these people around opera houses. For example, in Kirov we have a group of sixty or seventy that come every night. They love opera, so they come. At performances of Pique Dame, for example, if you do it eight times a season, they come all eight times! They want to compare different singers, or they just love it and they come. For them, it's a part of their life. It's as necessary as it is to drink water or eat bread. This is something special. There are many people like that, real fans, and you meet them everywhere. When the Kirov Opera was at the Met, I saw a big group of people who were coming every day. They visited nearly all the performances, and they were very interested in which cast is performing tomorrow, and what is the difference, and they had immediately favorites. They just like music, and they don't pretend to be great composers or great conductors, but they just come and listen. They find more time for music, sometimes, than professionals, and they pay more attention. BD: These are the kinds of people you particularly like in your audiences? VG: Of course. I'm also a bit scared if they don't like the performance, because that makes me less happy about results. You really don't want to upset these people. This is the last thing you want to do because they expect something special. BD: Are they too critical? VG: No, it's not a problem if they criticize you; it's just the feeling that you want to see very happy faces. BD: But shouldn't music - Russian music and Western music - be for more than just this core of people? VG: Of course, of course. It's much wider. Music is also delivered thanks to radio, television and recordings or videos, so it's delivered to millions and millions now. I'm not worried about serious music, I have to say. I never, never was convinced that we all have to ask millions and millions to turn to the serious music. I think it's not necessary that 90 percent of the living population of each country has to be incredibly connected with serious music. It's a hopeless dream that you will have maybe 15 percent, but they will exist! Another 20 or 30 percent - or even more - will belong to rock music. It's a different value. When you go to listen to a Bruckner symphony or you go to Michael Jackson's concert, for example, it's quite different, and you don't expect the same person to be in both places. BD: We shouldn't try to get the Michael Jackson crowd into the concert hall? VG: We shouldn't. I don't think it's absolutely necessary because the concert hall has to be special; like a sort of religious feeling that if people will go there, they will feel that there is something much bigger than yourself. It's not just fun, there is something more, and it is spiritually rich. BD: So where is the balance between the artistic richness and the fun? VG: Mmmm... Fun is fine, a nice thing, but with the arts there is already something serious. For example, many of the great composers lived in very dramatic circumstances, often when they were dying. Mozart was a tragic, tragic situation, or Beethoven's life, or Schubert. Take Shostakovich, for example, in our century. He had an ultra-dramatic life. We don't have to live like them, but we have to understand that if we are more or less comfortable with our lives - which is a nice thing - but it's not just "fun" to listen to a Shostakovich symphony. I don't believe in this word. BD: Is this to say that composers really have to suffer? VG: No, no, it's not necessary. I just mean that many of the great composers, or at least most of them or a solid part of them were somehow suffering. That's why the strength of their language, the strength of their voice, their personality makes you understand. Mahler, for example, certainly suffered, and it makes you more serious than if you just go to a light music concert. That the music is serious is clear for us, but it also makes you more serious. So you think of something that man can achieve and that man can feel because it's about a wide amplitude of our feelings. The whole spectrum of our emotional feelings is put there. It's not just rhythmic excitement or high dynamics, but it's also something else. You are more involved in the whole range of feelings. But there is something else with what I call "serious music." For example, it's a big problem to perform a Beethoven symphony because if we try to play it in a brilliant way with all the brilliant possibilities of a great orchestra like Chicago, it's one way. Then if you still try to connect it with Beethoven's life or his situation, it will be a completely different way. It's risky and you will not necessarily succeed if you go this way because it is something that was maybe easier to connect with the previous generations. Look at Furtwängler, for example. He had very, very dramatic circumstances. Furtwängler was conducting when the Nazis were in power, and later Germany was losing the war. He was the Music Director of the Berlin Philharmonic, and it was the dramatic part of his life and dramatic sign of his genius, I would say, that gave him extra strength. There was such a complex and dramatic conflict inside this person. He loved German culture, he loved German music, he loved his Berlin Philharmonic Orchestra; I don't think he loved Hitler and his theory, and I don't think he was supporting what was going on; I also don't think he was very glad that Germany was losing the war. There were so many dramatic circumstances that the artist finally became even greater. He was still keeping the value of his life; he was still fighting circumstances and was keeping the orchestra and the repertoire in the very best hands - his own hands. BD: Is there any kind of parallel we can draw in your own life, as you were growing and developing under the Soviet system? VG: Yeah, it's mixing everything now. Everybody's trying to find the way. BD: Will it all get sorted out eventually? VG: That is difficult to say. Nobody knows. I find that there are enough problems everywhere with the arts - in Russia, in Europe, in America there are many problems. That's why the great artists - like the American Leonard Bernstein or the German Furtwängler or the Russian Mravinsky - if we talk about conductors they are very different. This is a good thing because we can't pretend; we will not succeed. We can't try to please everybody. You can't do it. You have to belong to something. You have to represent culture, tradition, language, musical style, sound atmosphere. That's why the greatest people were very successful because it was the best way. Bernstein was typically American, so that's why he was an international superstar. I shouldn't use this word, "superstar." He certainly was superstar, but I don't think he wanted just to be a star; he just wanted to be a musician, an artist, and he had his God. Today it was Mahler, tomorrow it was Beethoven, but he was serving music and he was incredibly successful at it. To the international world, he brought with him the best American way. To make music, to feel music, that's why we value him as number one from American culture. And we still think that Furtwängler was this very best German for music-making. If some Russians are successful, that means that they are also very much connected with what it means to be Russian with our tradition. This interview was recorded in a dressing room backstage at Orchestra Hall, Chicago, immediately following a concert on October 16, 1992. Portions (along with recordings) were used on WNIB twice in 1993, and again in 1996, 1998 and 1999. This transcription was made and posted on this website late in 2011.